If you ever find yourself in need of auto glass repair in Southeastern Massachusetts, the city of Providence or anywhere in the state of Rhode Island, give The Glassman a call! We'll come to you and get your windshield fixed up right away! When the windshield glass on your vehicle is chipped, it is important to act quickly to prevent leaks, further damage, vision obstruction, and having to replace the factory seal. Simple chips and windshield breaks can spread over time, so be sure to repair your windshield before more damage occurs, otherwise you'll need a full windshield replacement. Windshields consist of two layers of auto glass with a thin layer of vinyl in between them. It is this vinyl layer that prevents the glass from shattering. In most cases, it's just the outside layer that gets damaged. 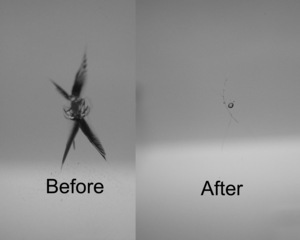 To fix your chipped windshield glass, we inject resin into the break. After injection, we use ultraviolet light to harden the resin and prevent the chip from cracking any further. While the crack is still slightly visible, this preventative measure keeps it from spreading. Repairs usually take up to 30 minutes and are guaranteed not to crack any further.